Happy employees are productive employees. Easy to use applications improve the employee experience. But if that’s where your efforts begin and end, your employees may not be getting the message – and your bottom line may take a serious hit. Happy employees are productive, efficient employees. But if you really want your team to feel valued and supported, it might be time to think beyond the break room. Everyone likes free food – but even donuts can’t compensate for outdated, inefficient software applications that are a source of employee frustration. As business owners, we’re all aware of the importance of customer experience. We engage UX teams to gather data, conduct brainstorming sessions, and develop new products and services to give our customers the best possible experience. We know a frustrated customer probably won’t return. But what about employee experience? What happens when employees are frustrated by outdated or inefficient applications? And, perhaps more importantly, what can you do to prevent the frustration in the first place? If you’re looking for ways to boost employee morale, application usability is a great starting point. Consider the tools used by your employees in finance, HR, manufacturing, sales, and customer service. Is your team equipped to be as efficient and productive as possible? Are new-hire Millennials frustrated with old, slow, training-intensive interfaces? Are your less tech-savvy workers struggling with issues better left to programmers? Is the help desk overloaded with complaints about poorly designed web tools? If your answer to any of these questions is “yes,” you may have an employee experience problem. Left alone to deal with subpar technology, most employees will do their best to find shortcuts or workarounds to deal with antiquated interfaces. In some companies, these workarounds become standard procedure and find their way – officially or unofficially – into employee training and onboarding. The biggest problems with workarounds? They’re inefficient and frustrating. An employee using outdated HR software may have to build five extra steps into a task simply to avoid glitches or sidestep interface issues. That doesn’t sound like much but spread across a whole department those extra steps add up as employees spend more time on workarounds than they do on the task at hand. The result? Poor employee experience, lower productivity, less accuracy, and higher turnover rates – all of which will affect your bottom line. In his book The Future of Work, futurist and corporate consultant Jacob Morgan encourages business owners to be proactive about improving employee experience: “We have to start investing in technology and advanced tools that help our employees do their jobs more efficiently,” he writes. There’s no getting around it: If you want to improve your employee experience, you’ll need to invest time and money to do it right. And if you’re not sure where to begin, consider bringing on a UX specialist to help. A good UX specialist has the skills and expertise to analyze employee productivity and identify usability issues that may be putting a strain on your business. More importantly, a good UX specialist can help develop and design solutions for a more intuitive, satisfying employee experience. When hiring a UX specialist or team, look for professionals who not only have a solid understanding of the project objectives and constraints but understand how to work with many different personality types. You’ll want a team with the “soft” (communication and interpersonal) skills necessary to draw out solution-based feedback from users. Your UX specialist should also have the ability to work in an agile environment and have a proven track record of creating beautiful, usable, and efficient products. Those motivational posters might be corny, but they’re right: Your employees really are your company’s most valuable resource – and they can make or break your bottom line. Outdated tools and complicated workarounds are frustrating. And frustrated, unhappy employees are less productive and more likely to move on to companies where they feel valued. 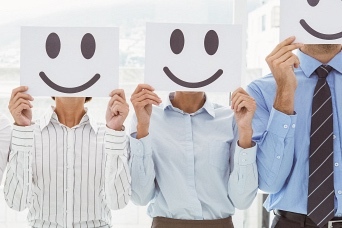 When you take the time to invest in creating a positive employee experience – to give them intuitive, current, and user-friendly applications – the return you gain in motivated, engaged and happy employees will be reflected in your products and your brand. Once you’ve eliminated workarounds and have the right tools in place, the occasional free donut doesn’t hurt. Convective has extensive experience in building internal web applications that increase productivity, decrease strain on training and help desks, and make employees happy. Make employee experience a strategic part of your business plan.